A US Navy work diver is lowered to the sea bed during a dive from the USNS Grasp (ARS 51) off the coast of St. Kitts. A clearance diver was originally a specialist naval diver who used explosives underwater to remove obstructions to make harbours and shipping channels safe to navigate, but later the term "clearance diver" was used to include other naval underwater work. Units of clearance divers were first formed during and after the Second World War to clear ports and harbours in the Mediterranean and Northern Europe of unexploded ordnance and shipwrecks and booby traps laid by the Germans. In some navies, including Britain's Royal Navy (RN), work divers, which includes Ship's divers, must have a line and a linesman when possible. The first units were Royal Navy Mine and Bomb Disposal Units. They were succeeded by the "Port Clearance Parties" (P Parties). The first operations by P Parties included clearing away the debris of unexploded ammunition left during the Normandy Invasion. Six groups of Clearance Divers including Commonwealth and European allied forces were in operation by 1945. Naval work diver training is much longer and harder than sport diver training and has much stricter entry requirements. For a long time navies used the heavy standard diving dress for underwater work. During and after World War II some of them started using frogman-type gear when frogman's kit became available. 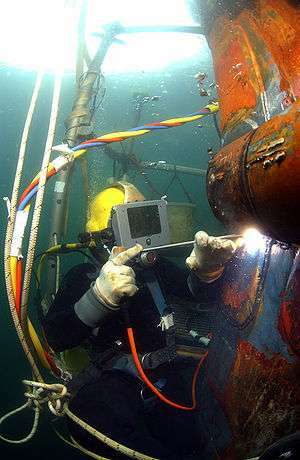 Later they started often using open-circuit scuba gear for work diving. The Royal Australian Navy Clearance Diving Branch clearance divers also serve as combat divers. The Royal New Zealand Navy Operational Diving Team (ODT) are clearance divers and also serve as combat divers. France: France's Clearance Divers are called the Plongeurs Démineurs (link in French). Germany: Minentaucher is Germany's Clearance Diver force. Ireland (Republic of): Naval Service Diving Section (NSDS). Norway: Minedykkerkommandoen Norway's naval work divers and Clearance Diver force, "Norwegian Naval EOD commando". Portugal: the Sapper Divers Group, which also serve as combat divers unit. British Royal Navy naval work divers are officially called Clearance Divers. During WWII they at first often used the Davis Submerged Escape Apparatus and no diving suit, and no swimfins and they swam by breaststroke. On 1942 December 17 (ref. Decima Flottiglia MAS#1942), 6 Italians on three manned torpedoes attacked Gibraltar harbor. A British patrol boat killed one torpedo's crew (Lt. Visintini and Petty Officer Magro) with a depth charge. Their bodies were recovered, and their swimfins were taken and used by two of Gibraltar's British guard divers (who dived with Davis Escape Sets and (up to here) breaststroke swimming and no fins) (Sydney Knowles and Commander Lionel Crabb). This was the first known British frogman use of swimfins, rather than a Sladen suit and weighted boots riding a Chariot. In 1944 November in Livorno in Italy an Italian frogman called Vago came over and joined the British frogman team and brought them two Decima Flottiglia MAS issue oxygen rebreathers, which proved better in use than the Davis Submerged Escape Apparatus and lasted longer on a dive. He also brought them an Italian light 2-piece frogman's drysuit: before then they dived with their skin exposed. 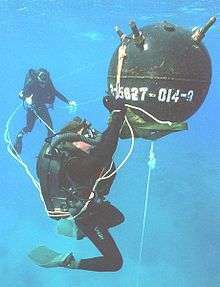 For many years Clearance Divers used the Siebe Gorman CDBA rebreather. In 1982 Clearance Divers were heavily involved in the Falklands War, in which Britain recaptured the Falkland Islands from Argentina. They received many awards and medals for their work on mines and disposing of 1000-pound bombs lodged in British warships. In the 1990s they used a type of automatic mixture rebreather which is so heavy that on surfacing after a dive even a very physically fit naval diver preferred to remove the rebreather while still in the water and have it craned out separately. Sladen suit and weighted boots and Siebe Gorman Salvus. Sladen suit and weighted boots and aqualung. According to a 1950s British naval diving manual, this was the only approved way to use the aqualung. Presently, Fleet Diving Units 2 and 3 are the main clearance divers of the Royal Navy. Fleet Diving Unit 1 is also focused on clearance, specifically terrorist devices. Frogman; someone who is trained as a combat diver. ↑ Quick, D. (1970). "A History Of Closed Circuit Oxygen Underwater Breathing Apparatus". Royal Australian Navy, School of Underwater Medicine. RANSUM-1-70. Retrieved 2009-03-20. ↑ Goble, Steve (2003). "Rebreathers". South Pacific Underwater Medicine Society Journal. 33 (2): 98–102. Retrieved 2009-03-20. ↑ http://www.amazon.co.uk/Diver-Tony-Groom/dp/1906266069 Book description: Clearance Diving in the Royal Navy, including their work during the Falklands war.